Last week I was literally giddy about being called to King County Superior Court for jury duty selection. Oh, what an adventure it would be! Maybe I would get a juicy trial! I fantasized about the whole process. How I would be so impartial in the answering of the questions that they would have no choice but to pick me. Then, how I wouldn’t be able to discuss the details of the case with even my own family. And seeing the courtroom drama unfold before my eyes with those, “Your honor, I object!”, moments. But any romantic notions that I had in my head from watching too many old movies were quickly and completely dispelled. I sat in a room filled with other jury hopefuls and did nothing but wait. And try (with spotty wifi) to work remotely on my laptop. I was never called – and after two days I was dismissed. I would have liked the opportunity to at least get in the courtroom and see some of the process. How disappointing! They did, however, give us an hour and half for lunch so I had the opportunity to explore some of my favorite (and now some new favorite) places in downtown Seattle! Ah! Adventure! At last! I have been craving a really good deli sandwich lately, and have heard such good things, so I decided to give Tat’s Deli a try. I ordered the New Yorker with coleslaw but next time I will order it toasted (this baby was so big and juicy that I ended up having to eat it with a knife and a fork. And still could only eat half!) The fries are awesome here too – I put some on my sandwich and it was heaven! While I was on a New York kick, how about some cheese cake? I thought I would offset the enormous-ness (okay, I know it’s not a word – but if you saw it, you would agree) of the sandwich with these miniatures from The Confectional in the Market. But since it was still February, I had to “settle” for a purists order of the New York flavor and the, be still my heart, Quadruple Chocolate. I had never had the chocolate before – and now? I will never come away from The Confectional without it! 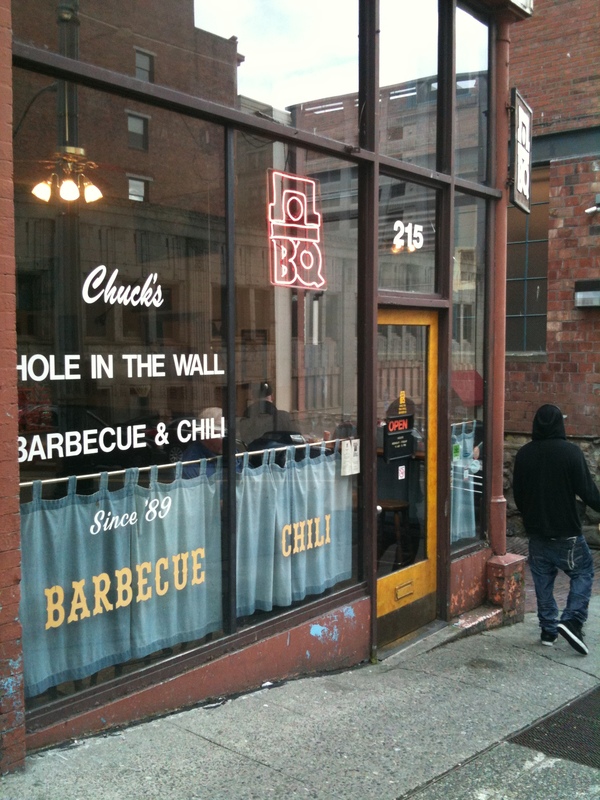 On the second day, I made a discovery right by the courthouse – Chuck’s Hole in the Wall Barbeque & Chili. The sign says they’ve been there since ’89 – why have I never heard of this place before?! The sweet fragrance of smoked meat permeates your skin the moment you set foot in the door! The menu is simple and the place is small – thus the “hole in the wall” title. But the food and prices are just right! For about $8 I got a pork slider, a cup of chili and a side of coleslaw to put on my sandwich. The slider was so mounded with meat and so satisfying that I didn’t even finish the cup of chili that I just had to try! I have to say that while I am not the well-traveled connoisseur of BBQ that many people are, I do know what I like in food and this is the best pulled pork sandwich that I have ever had! And the chili! Man! I love me some chili! They don’t even bother with toppings here, like cheese or onions – this stuff stands on its own! 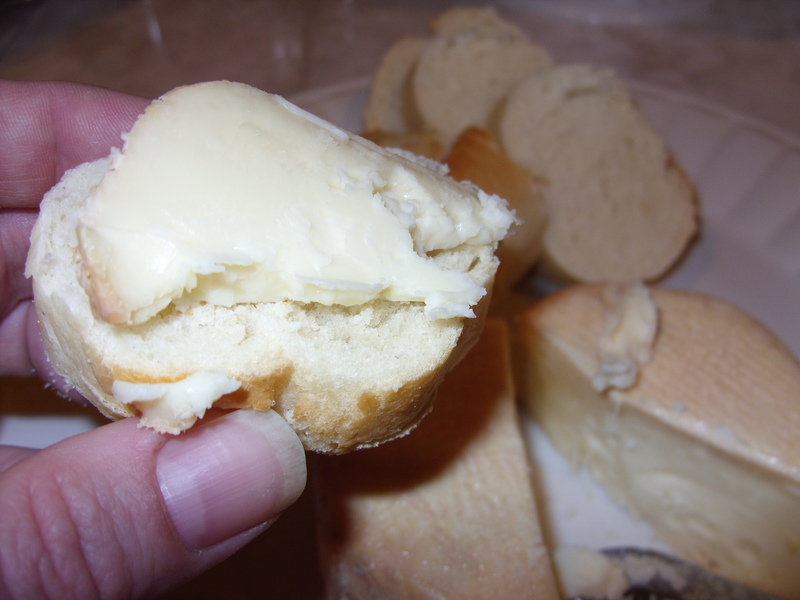 Speaking of cheese, have you ever had a cheese that goes great with beer? Usually we think of cheese pairing well with wine. I adore Mt. Townsend cheese and usually get my fix at the farmer’s market in the summer but they recently opened a small storefront in the Market! I have been dying to go! So good on some fresh crunchy bread! While I was there I found out about a great new festival that is happening in Seattle in April. The Washington Artisan Cheesemaker’s Festival on Saturday, April 7th at the Seattle Design Center. 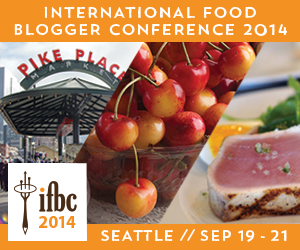 Featuring all local cheese maker’s – and we have a mighty fine selection of them in Washington State! Looks like an event right up my alley!